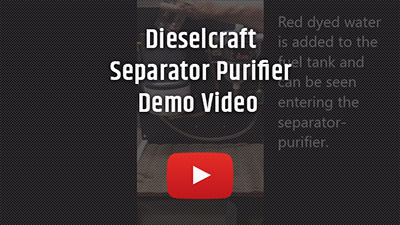 Dieselcraft engine oil centrifuges provides ten times more cleaning power than the standard oil filter removing particles of 1 micron in size or smaller. Engine oil and fuel cleaning technology business since 2002. Expertise to reduce operating costs and fix your problem. Quick, simple and low cost Fuel Test Kits to help diagnose fuel problems. Bypass oil filtration system using an oil centrifuge with no filters to purchase to double your oil life. Fuel water separator/purifiers to solve your filter plugging problems. Let us help you! Call or contact us today! Did you know that soot will enters an engines lubrication oil at the rate of .0048 oz for every gallon of diesel fuel burned? Burn 210 gallons you get 1 oz of soot in the oil. Burn 3360 gallons and get 1 pound of soot in the oil. A large truck will burn 1,786 gallons of fuel every 12,500 miles, at 7 mpg. During this 12,500-mile interval, more than half a pound (8.5oz) of soot will enter the oil. 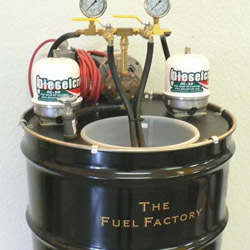 The Dieselcraft Centrifuge cleans engine oil by generating a centrifugal force which is 2,000 times greater than gravity. Find out more about Engine Oil Cleaning. 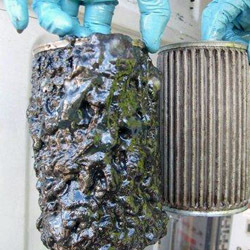 Fuel Microbe Testing will solve the problem of what is plugging filters. The DS-1 Fuel Test finds the microbes/algae that cause most fuel problems. Waste Oil Reclamation The system will clean any waste motor oil, transmission fluid or vegetable oil without any filters. Also will clean dirty diesel fuel. Fuel Polishing Systems. 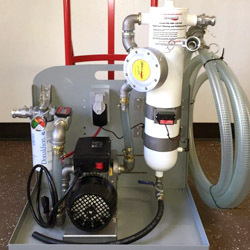 The FPS 400 is a 7 GPM system that does everything the completion does at a budget price. Removes 99% of the water and filters to 10 microns. 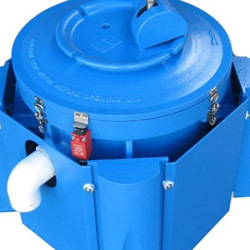 Continuous Automated Centrifugal Filtration For liquid solid separation, the system is offered as a turn-key 3000 Gravities and a processing rate of 16 GPM unit.